JAVIR specializes in development of java packages, beans and application for business. We strongly believe in the future of Java technology and offering high performance, reliable foundation for your business applications. HybridList package is a perfect tool to manage very long ordered lists. It is based on the unique algorithm which is much more efficient than binary trees, red-black trees, skip lists and even hash tables. This package is ideal for creation of memory based dictionaries : HybridList supports inclusion of the same node into several lists. See DictionaryExample to find out how to manage sample data base of clients. Search and selection operation are very fast and simple to implement. TestPerformance page demonstrates stunning speed of this algorithm. Optimizer package includes set of algorithms for multi-parameter non-linear optimization such as gradient and Davidon-Fletcher-Powell methods. 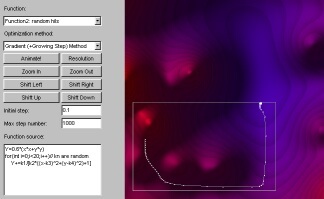 The package includes unique technique for setting limits that is based on axes distortion. FunctionViewer class is a part of Optimizer package to visualize function in 3D-Topo manner. This applet can be changed to draw your own functions. It gives you a chance to see how various algorithm deals with predefined or your own functions. The applet includes light source animation so you can understand what complicated 3D functions look like. EasyButton applet is a FREE Dan Kozub's applet with various effects: gradient fill, animated color, user-defined fonts etc. You can also buy the source code that contains a lot of useful functions and non-standard solutions. The licence with free updates and e-mail support costs only $12.95. Statistics package is based on use of Optimizer package to work with panel data. The major purpose is the search of multi-parameter non-linear function which describes some data as well as possible according to least-square or other criteria. Thermodynamics package is a tool to simulate and forecast dynamics of the reactions between several chemical substances. We are open for cooperation. If you are interested in our products or have any suggestions, questions, propositions, please, do not hesitate and contact us.